Bombardier has signed a contract with Eurotunnel as part of the Channel Tunnel operator’s 2018–2026 mid-life refurbishment programme. The contract is for Bombardier to renovate nine PAX shuttles. That equates to a total of 254 shuttle cars. 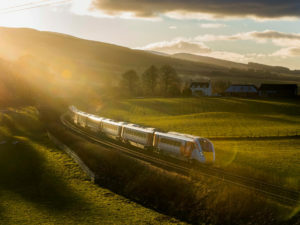 These 800m shuttles are designed such that they carry passenger vehicles with passengers remaining in their vehicles throughout the 35-minute journey between the UK and France. The Channel Tunnel has now been operational for 25 years. During that time each one of these shuttles has made an average of 300 return trips every month. In total they have carried more than 236 million passengers between the two countries. This contract is worth 150 million euros (171 million USD) over a seven-year period. Bombardier will begin delivering the refurbished shuttles from mid-2022 onwards. The final delivery is then estimated for mid-2026. Bombardier France and Belgium collaborated to develop the original PAX shuttles in the 1990s. It marked the launch of Bombardier in France. Now, in 2019 Bombardier is celebrating the 30-year anniversary of its Crespin facility. Each one of the nine shuttles consists of 26 wagons. These break down as follows: firstly, 12 single-decker carriages to transport taller vehicles such as coaches, minibuses, caravans and any other vehicles over 1.85m. Secondly, 12 double-decker carriages for cars and motorbikes. And finally, 2 double-decker loader wagons as well as two spare loader wagons. Bombardier is the project technical advisor for the refurbishment works. As such it will lead the integration and renovation operations, excluding the single-decker loaders. It will also lead on engineering design and procurement for the on-board equipment. Eurotunnel, meanwhile, will be responsible for the design and procurement of key equipment. These items include brakes, doors, fire doors, fire detection equipment, HVAC and the double-decker loaders. Furthermore, Eurotunnel will oversee the homologation process once the refurbishment works are complete. Bombardier will provide technical support throughout to help prepare the necessary documents.